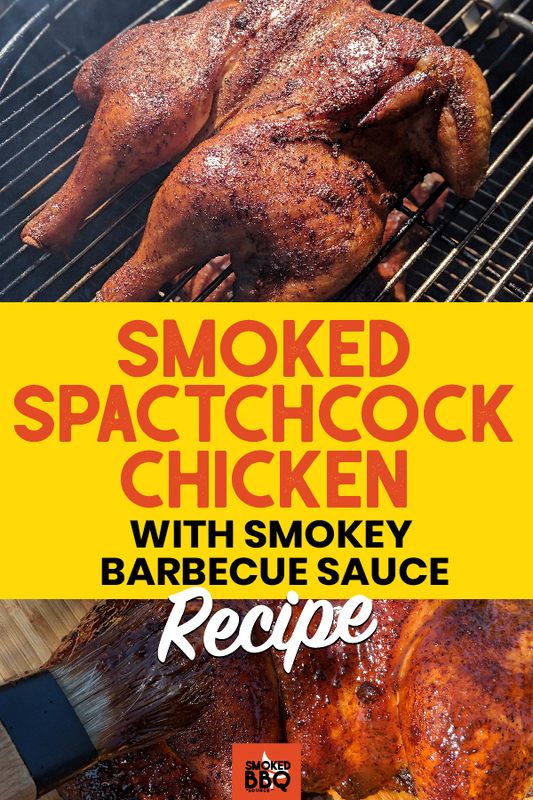 Spatchcocking is my favorite way to cook barbecue chicken. By removing the chicken’s backbone you can lay the chicken out flat on the grill which lets you apply the rub more evenly and makes sure it cooks faster. 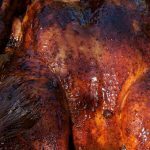 You can easily learn to spatchcock (also known as butterflying) a whole chicken yourself, or just ask your butcher to do it for you. Smoked chicken often has unpleasant rubbery skin. To get delicious crispy skin we crank the temperature of the smoker way up. 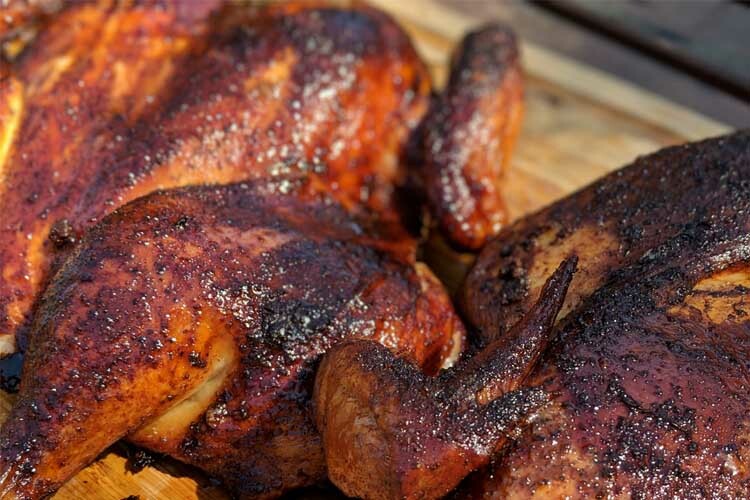 I like to use poultry rub and finish with a smokey barbecue sauce but you can experiment with different rubs and sauces. If you haven’t heard the term spatchcock or butterfly before don’t worry. 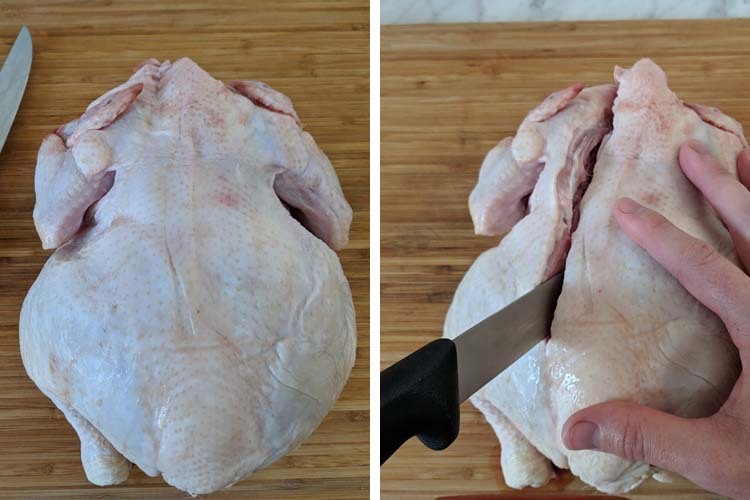 A spatchcock chicken is just a technique where you remove the backbone and flatten out the chicken. 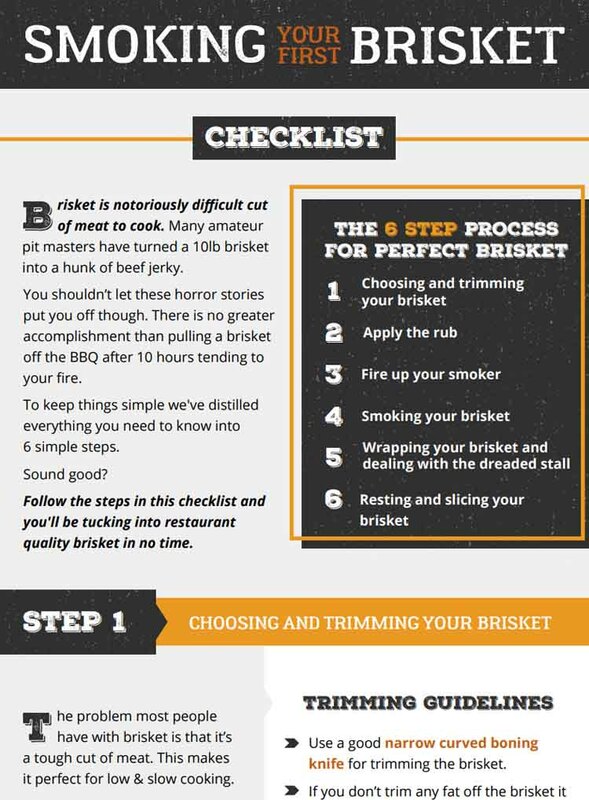 This method is perfect for the smoker, because you increase the surface area that sits on the grill. You can also get a more even coat of rub on the chicken. You also reduce the time it takes to smoke the whole chicken. All major benefits. Place the whole chicken breast side down on a clean chopping board. A butcher block with crevices to catch the juice works well. Start at the neck end and use a sharp boning knife or poultry shears to cut along both sides of the backbone towards the legs. You will need to use a little bit of a force to cut through the rib bones. Feel with the knife and you should be able to slice smoothly. Flip the chicken over and press down firmly with the palms of your hand so that the meat is flat and spread out. You should hear a crack. Be extremely careful handling the chicken as the tiny bones around the backbone can be razor sharp. Cuts are small but painful! You can also snip off the wingtips which are thin and easily burn. Discard the backbone and wing tips, or save it to make your own chicken stock. I like to spatchcock my chicken a few hours before I’m going to cook it, so that I can apply a dry rub and leave it in the fridge where it can really dry out. To get nice crispy skin it’s important to get the skin as dry as possible. Use a few paper towels and wipe the chicken down on both sides. Ignore the common advice to wash chicken. Rinsing poultry in the sink cannot remove any harmful salmonella or campylobacter so you’re just spreading any nasties around your sink when you do this. Lay the spackcock chicken out flat on a tray and sprinkle liberally with kosher salt. 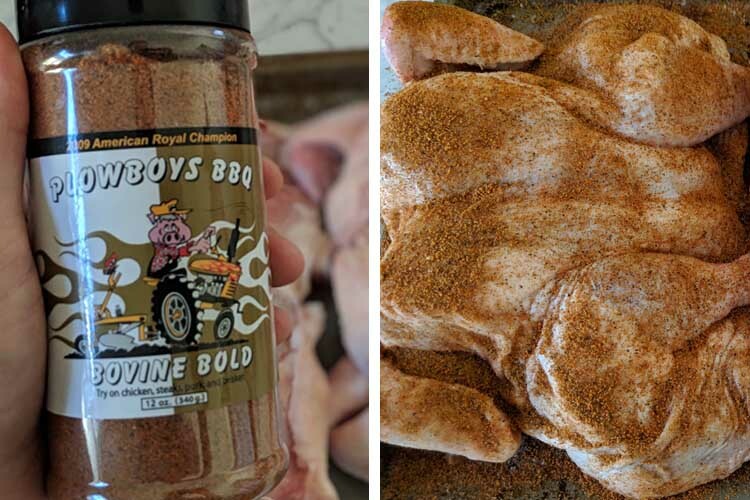 For this recipe I used some PloyBoys BBQ Bovine Bold rub. 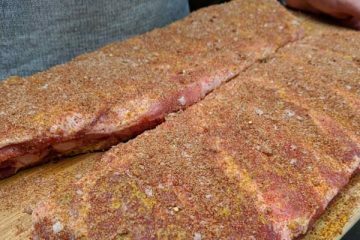 It’s a great general purpose bbq rub that isn’t too sweet or spicy. I use a rub shaker to get an even coat of rub on the chicken. Feel free to experiment with the rub. 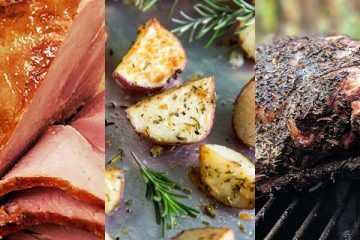 Check out our list of easy barbecue rubs to make at home for some inspiration. 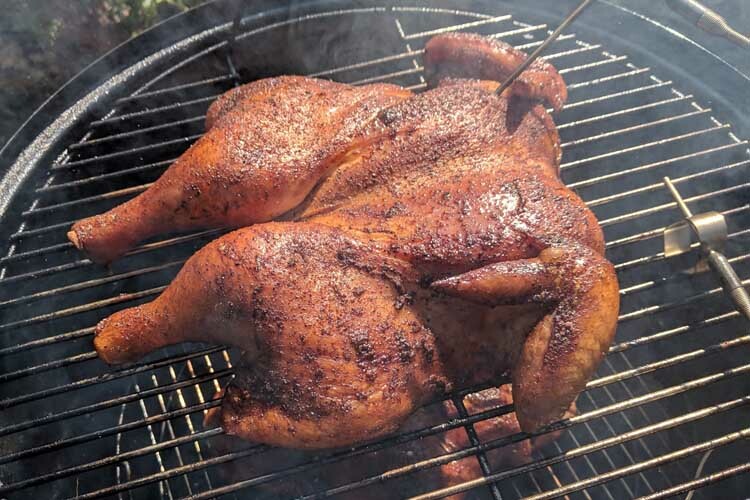 Smoking chicken low and slow is the best way to guarantee unpleasant rubbery skin. 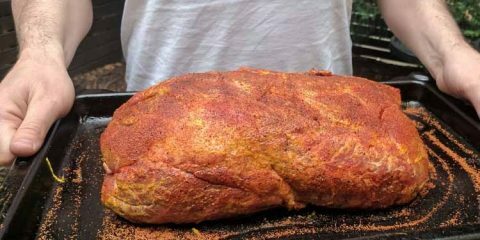 For this recipe you need to fire your smoker up to 300 – 350°F. I’m cooking this on my Weber Smokey Mountain. When the briquettes are starting to ash over, dump them into your Smokey Mountain. Pour another half a chimney worth of unlit briquettes over the lit coals. Once all the coals have started to ash over, add 2-3 good sized chunk of smoke wood. I like to use apple with chicken but any good smoke wood will do. Place the chicken on the grill, breast side up. I like to always do two at once so that I have plenty of leftovers. 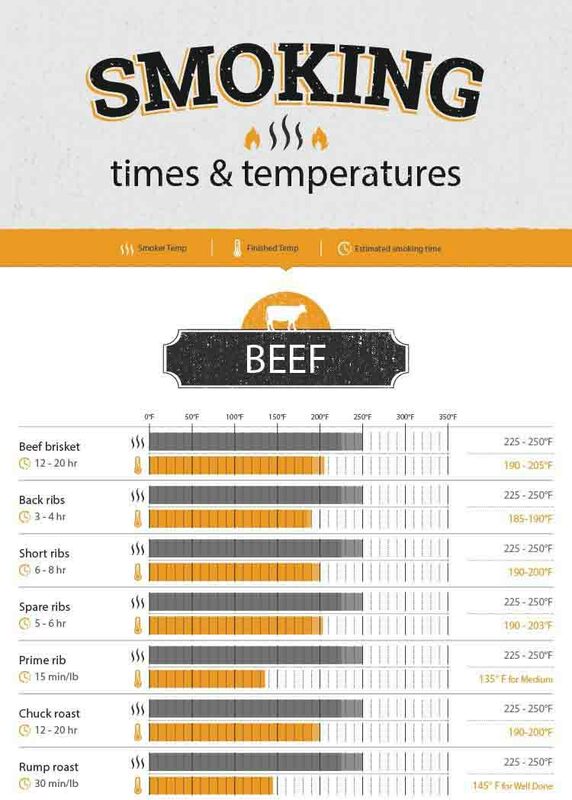 If you have one, setup your dual probe thermometer to measure the air temperature and the chicken temperature. I’m using my new Signals thermometer by ThermoWorks which let’s me monitor the temperatures from my phone. If you have one leave the water bowel empty, to ensure you get a nice hot temperature. I left the air vents on my Smokey Mountain mostly open, and after getting up to 380°F the temperature stabilized right around 325°F. I love making chicken this way because unlike most barbecue recipes, the food is usually ready to eat in just over an hour. 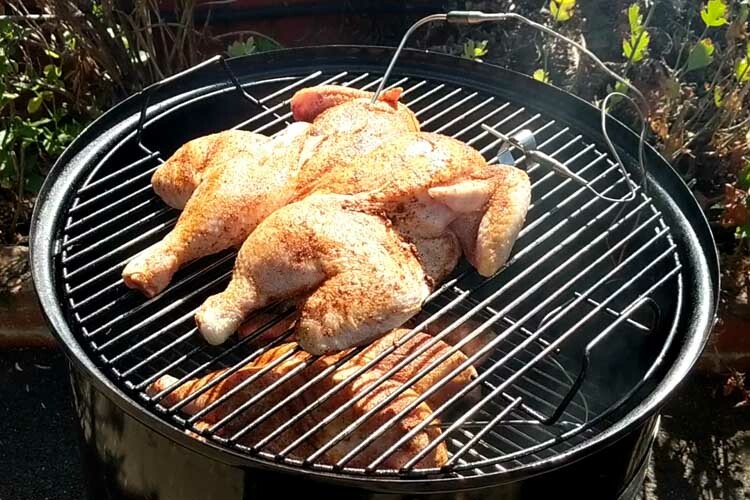 Exact smoking time will vary based on the temperature in your smoker, the size of the chicken and also how full your smoker is. For me it took just over an hour until the breast reached 165°F. Just before the chicken gets to the safe done temperature of 165°F in the breast, I like to take it off and apply barbecue sauce. 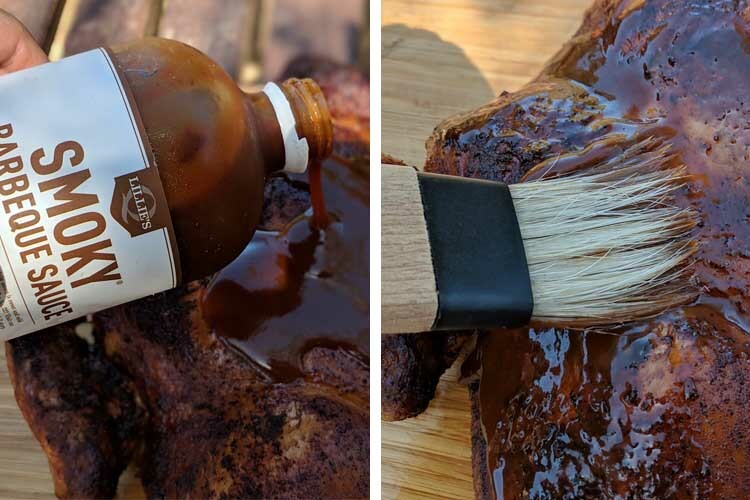 Lillie’s Q make a delicious smokey barbecue sauce that works perfectly with chicken. Any Memphis style sweet BBQ sauce will work well. Just pour the barbecue sauce over the bird and spread it with a mop or pastry brush. Put the chicken back on the smoker for about 10 minutes and let that delicious sauce glaze work it’s magic on the chicken. Now the chicken should be done and you have a few options. I like to cut it into sections for serving but pulling it is also fine. 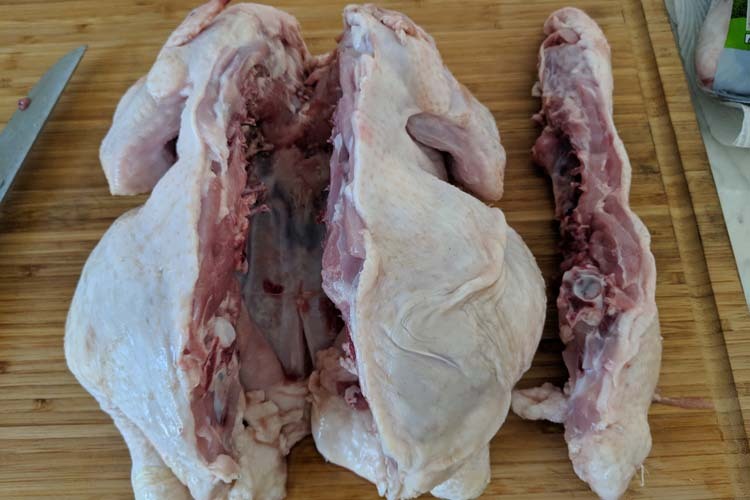 I slice the drumstick and thigh off, and then separate the drumstick from the thigh. Slice the wing off (try and cut a little of the breast off at the same time to make to give the lucky diner an extra meaty wing). Carefully cut along the backbone and remove each breast whole and then us a sharp knife to slice these into even pieces. I love to serve this chicken with smoked macaroni and cheese and a creamy coleslaw to cut through the smokey, sweet sauce. If your smoker was running nice and hot, the and you salted the chicken, then the skin should be nice and crisp. The meat will be super juicy with a light pink color that’s totally safe (the pink color comes from the smoke). Place the chicken breast side down on a clean chopping board. Use a sharp boning knife or poultry shears to cut along both sides of the backbone towards the legs. Trim any excess fat or skin from around the leg end of the chicken. Flip the chicken over and press down firmly with the palms of your hand so that the meat is flat and spread out. Sprinkle liberally with kosher salt and leave uncovered for a few hours in the fridge. Apply barbecue rub evenly over both sides of the chicken. 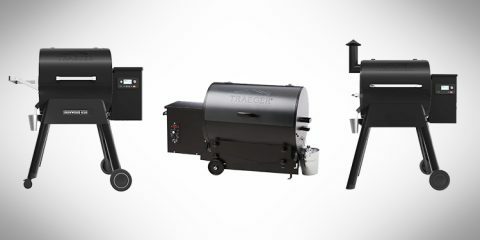 Set your smoker up for indirect cooking at 300 – 350°F. Add 2-3 chunks of mild smoke wood (apple or cherry are good options). Place the chicken on the grill, breast side up. 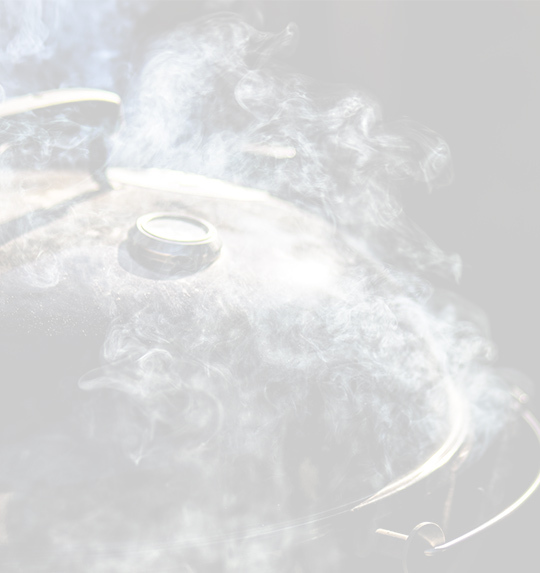 Smoke until the internal temperature of the breast reaches 160°F. Around 1 hour. 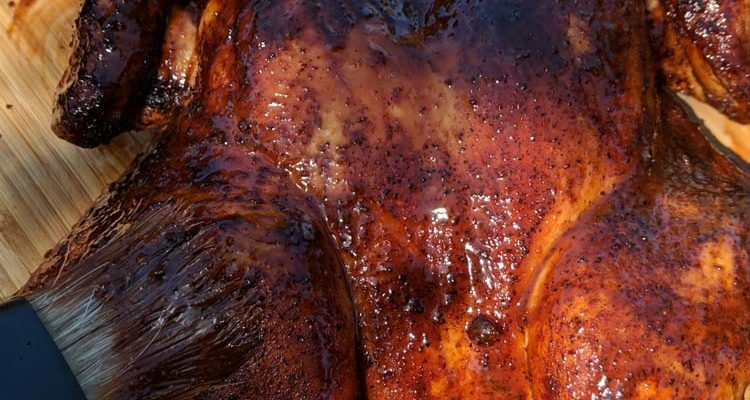 Take the Chicken off the smoker and spread barbecue sauce evenly over the skin. Place chicken back on the smoker for about 10 minutes or until the breast reaches 165°F. 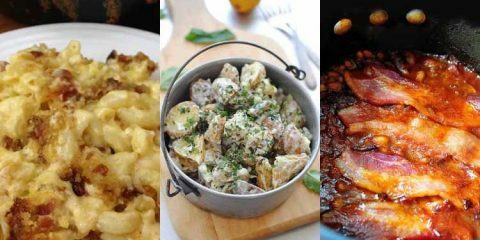 Slice the chicken up and serve with your favorite barbecue sides, or pull the meat and use in a sandwich.